Studio Tecnico Malnati S.a.s., based in Milan, Italy, was established 37 years ago by founder Giovanni Malnati. full packages for temporary electrical installation. Studio Tecnico Malnati is able to support EPC engineering companies, manufacturers of machines and contractors during both stages — the tender preparation and the execution of the work. For dams and tunnels, Studio Tecnico Malnati’s most important customers are the Italian company Salini-Impregilo and Austria’s Strabag. For permanent installations, Studio Tecnico Malnati works with customers like Bedeschi,Tenova-TAKRAF, ENEL, Buzzi Unicem and Agudio-Leitner, all of which have shown complete satisfaction with Studio Tecnico Malnati’s services. RULLI RULMECA manufacturer of rollers, belt scrapers, drum- motor. Studio Tecnico Malnati is recognized as a strategic supplier to major companies which build the whole machine and material handling systems on site. In the last five years, Studio Tecnico Malnati has worked closely with the managing director of Dutch company N.R. Koeling, which manufactures concrete cooling systems to cool concrete to the requisite temperature in the dam building sector. Another company Studio Tecnico Malnati represents is Rockwell Automation, whose products include inverters, PLCs, control systems, which can be applied to many different kinds of project. In order to remain competitive on the market, Studio Tecnico Malnati pays close attention to the relationships it has with all its partners and those it works with. Many of its professional relationships have grown through the years, and its wide reach enables it always to keep its customers and suppliers updated about ongoing and future work. Studio Tecnico Malnati’s representation of a wide range of companies means that it has been able to participate in many important projects all around the world. As its products are vital for the completion of many jobs, and because it keeps updated about the current market, Studio Tecnico Malnati has been very successful in the supply of dams and tunnels with several contractors. Studio Tecnico Malnati has been closely involved in important projects around the world, enabling it to strengthen its reputation in the marketplace. This has been further reinforced by positive feedback from customers in relation to its involvement in projects such as the Tocoma Dam, Panama Third Locks , GIBE III and Grand Ethiopian Renaissance Dam where all the rollers and rubber belts were supplied by RULLI RULMECA and S.I.G. , weighing systems and belt protection devices by Thermo Fisher Ramsey, and the process automation by Rockwell Automation. NEGRINI S.r.l., from Modena, Italy, considers customer satisfaction to be its primary goal, one that it achieves through a continuous and effective process of study and collaboration with both its customers and its suppliers. The company’s business philosophy is professionalism and versatility towards the different demands of customers. NEGRINI S.r.l.’s reliability depends on the professional abilities and experience of its highly qualified staff. NEGRINI’s technical office is always available to deal with and resolve any technical problem, and the solutions that it offers are always fully explained to the end user. When necessary, the company uses its engineers to develop solutions to the most complex planning problems. Today, the firm has 13 employees and uses, according to circumstances, a range of carefully selected external collaborators. The company has three facilities of about 750m2, equipped with four 6.3-tonne overhead cranes. Every enquiry is evaluated for feasibility. The elements of the enquiry, including the drawings, are studied and planned, in agreement with the head of department, in order to secure the established delivery time and the best use of resources. All technical data, including the drawings, are entered into a CAD CAM electronic system and three-dimensional solid CAD, for a better management of the product and a rational organization of the machines. Testing of the product is performed by skilled workers who are also sensitive to the customer’s needs. Before shipment, a final check up is carried out in the production department with the supervision of the owner himself. The business model means that customized products are supplied to companies involved earthmoving. All materials comply strictly respectful with the technical specifications and drawings requested, using reliable and historically well- known suppliers. NEGRINI can supply single certificates and attestations. All products are subjected to constant quality control procedures: both on arrival into the factory and during the production phase; before shipment, the finished product is submitted to further controls and testing, with the purpose of appraising the effectiveness of the applied manufacturing process and to guarantee a quality product to the client. 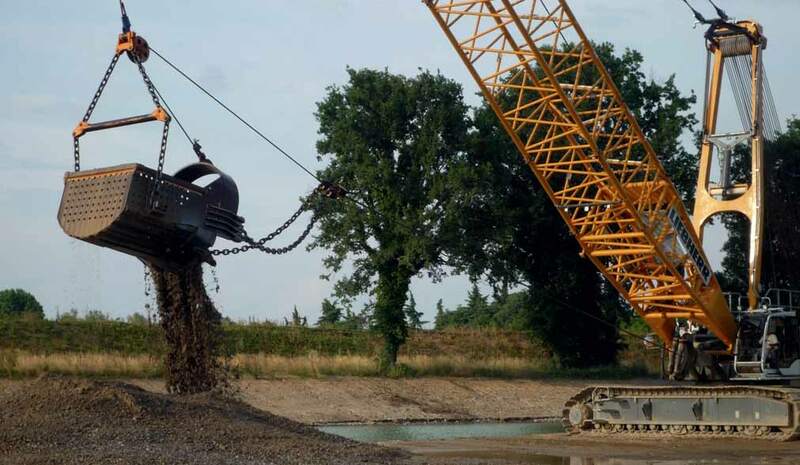 It is a well known that any good machine, be it cable crane or hydraulic excavator, will perform at its best only if the attachment used is well engineered and manufactured. In fact any good attachment will not only do a good job but will also reduce the machine stress, allow for safer working and save energy.